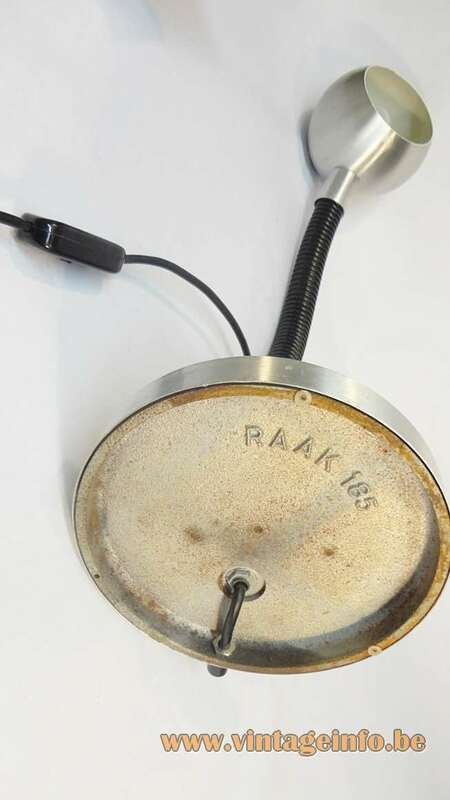 Materials: Aluminium, cast iron counterweight. 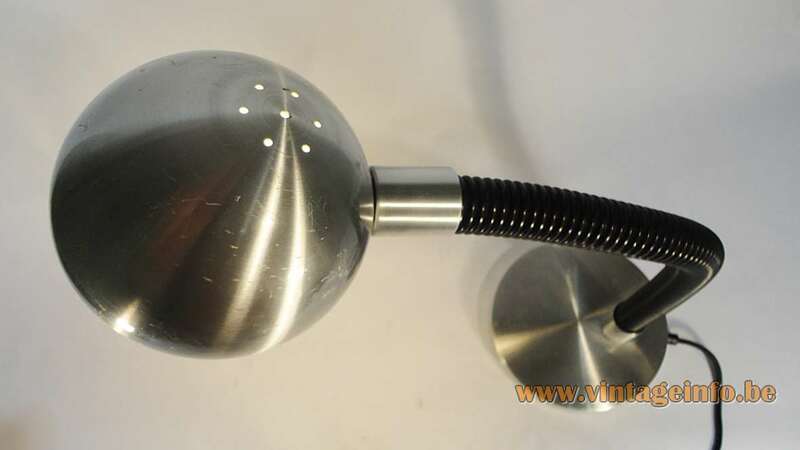 Iron goose-neck, plastic hose. 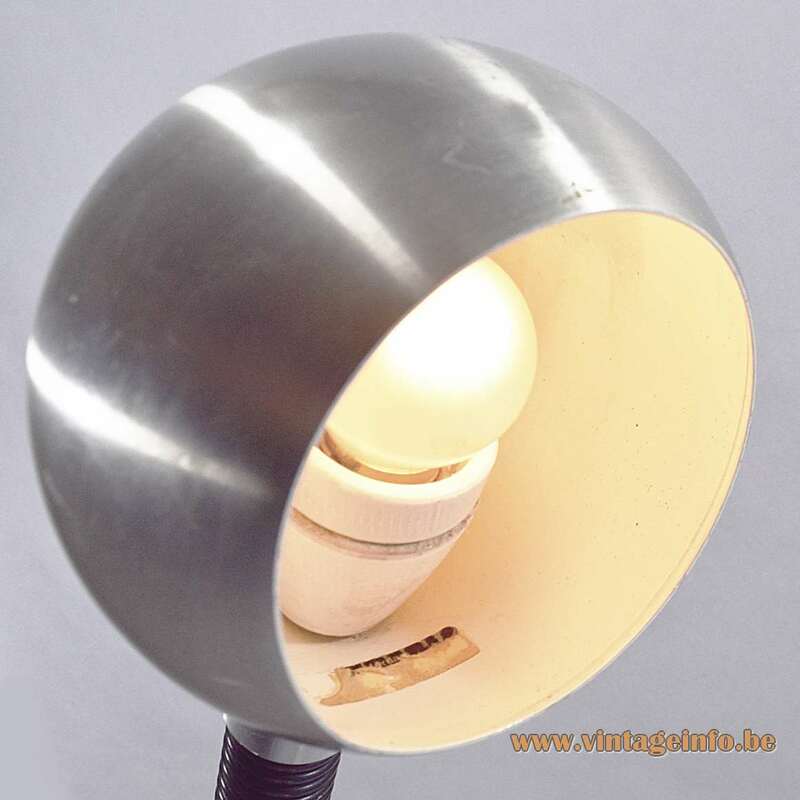 Porcelain socket. 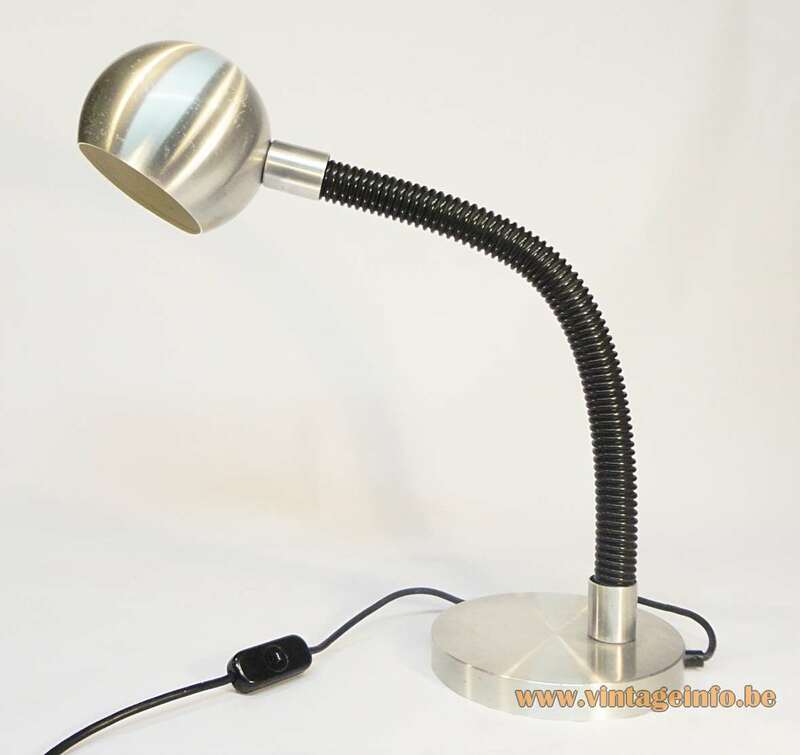 Any type of light bulb can be used, but preferably a small round white or clear bulb. 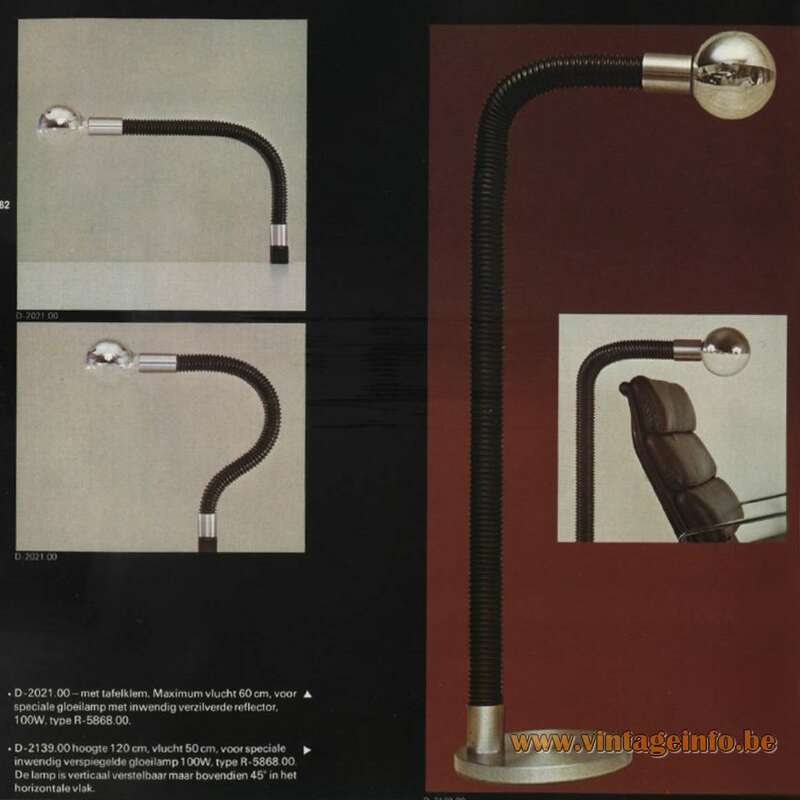 Other versions: Other examples are shown in the pictures below taken from the old Raak catalogues from 1968 and 1972: wall lamps, clamp lamps, floor lamps, table lamps, desk lamps. 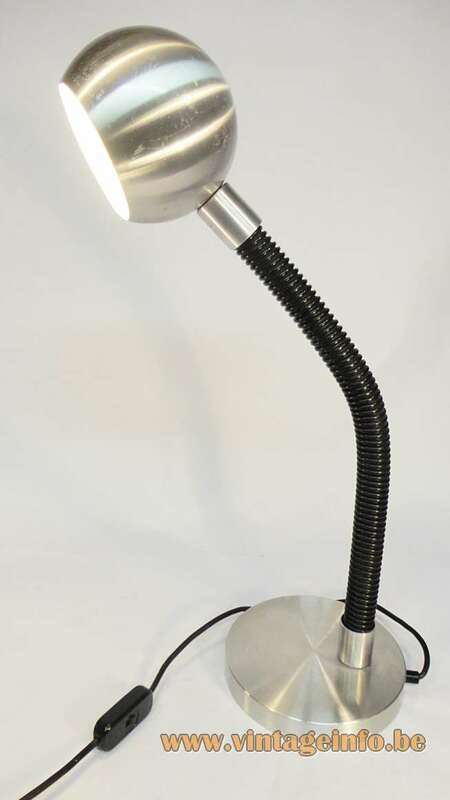 This lamp is model D-2124. 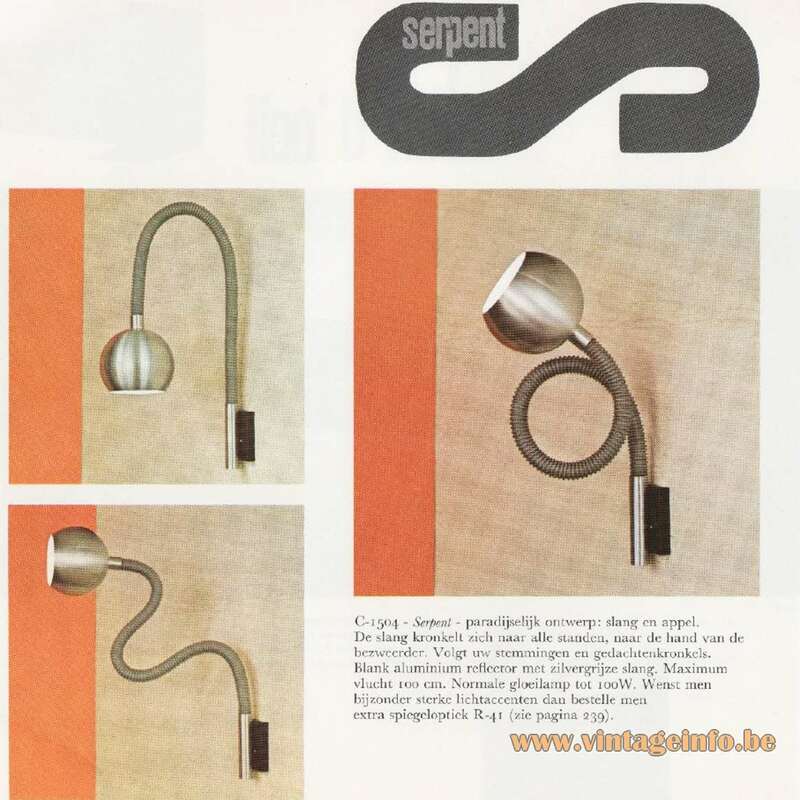 It only appears in an in-between catalogue from 1973, the Raak Studio Collection Catalogue. 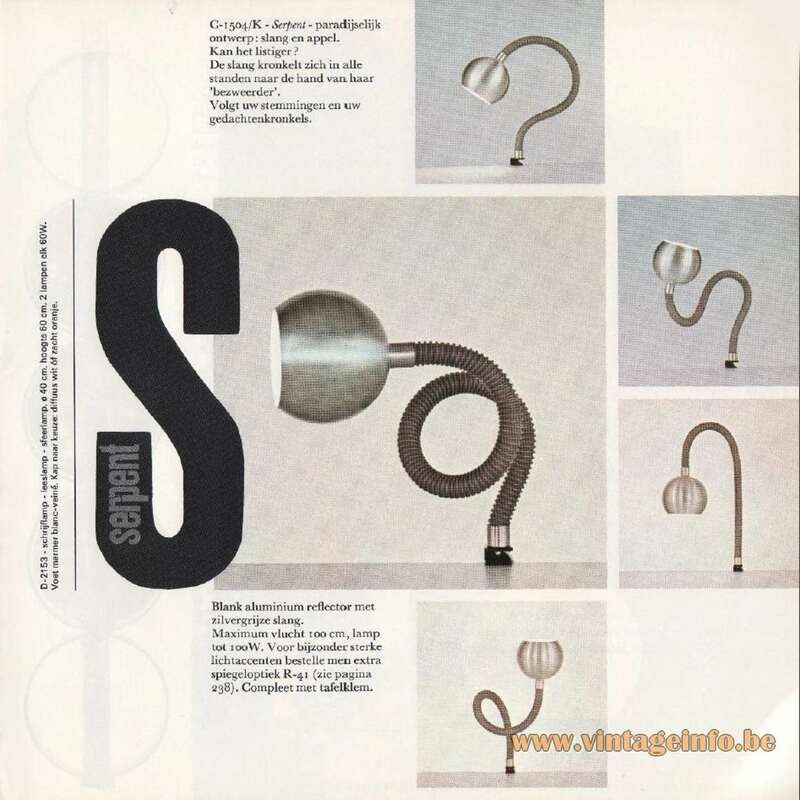 It was a small catalogue, intended only for the retailer (picture on the left). 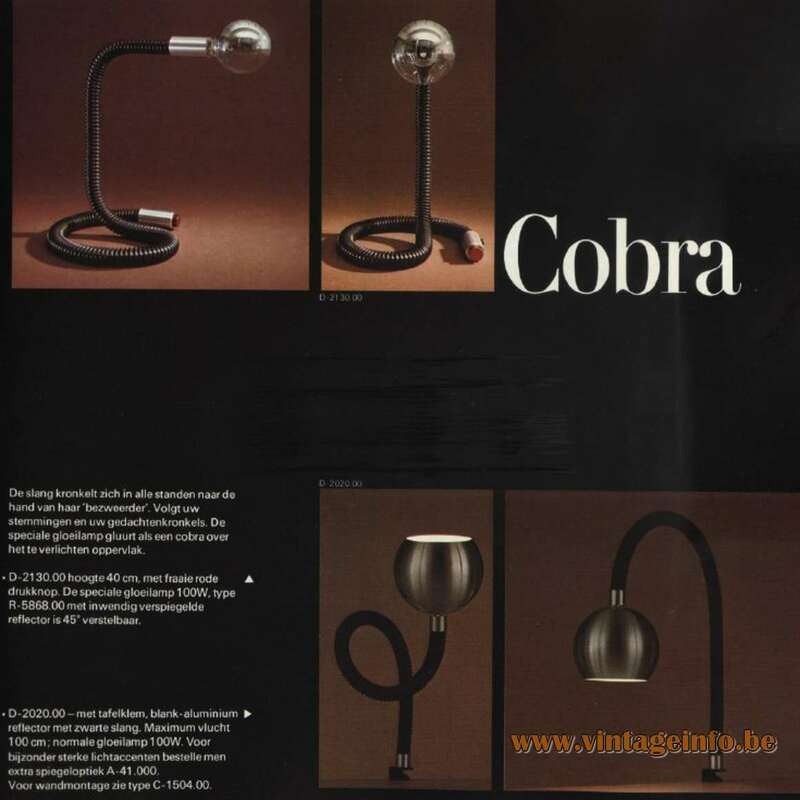 In the Raak Catalogue 9 from 1972 the Serpent lights were named Cobra lamps. Martine Le Forestier is a French designer born September 3th 1945. 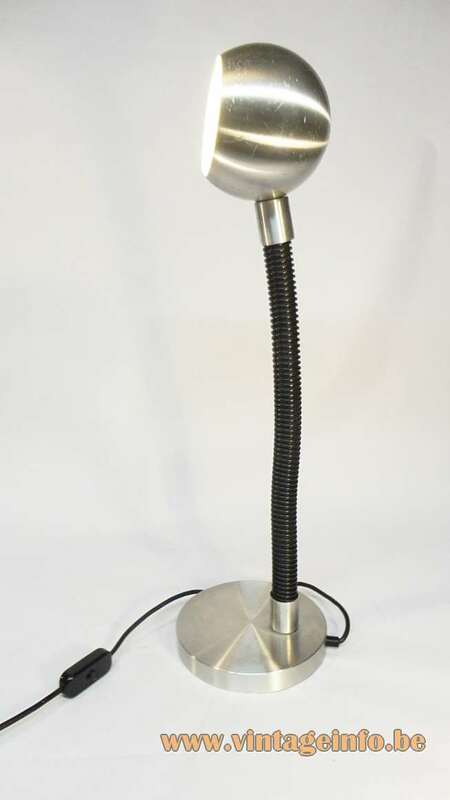 She studied at the ENS AMAA (Ecole Nationale Supérieure des Arts Appliqués et des Métiers d’Art – National School of Applied Arts and Crafts) in Paris and won the “Prix Vienot” prize in 1969 with her design of this lamp. 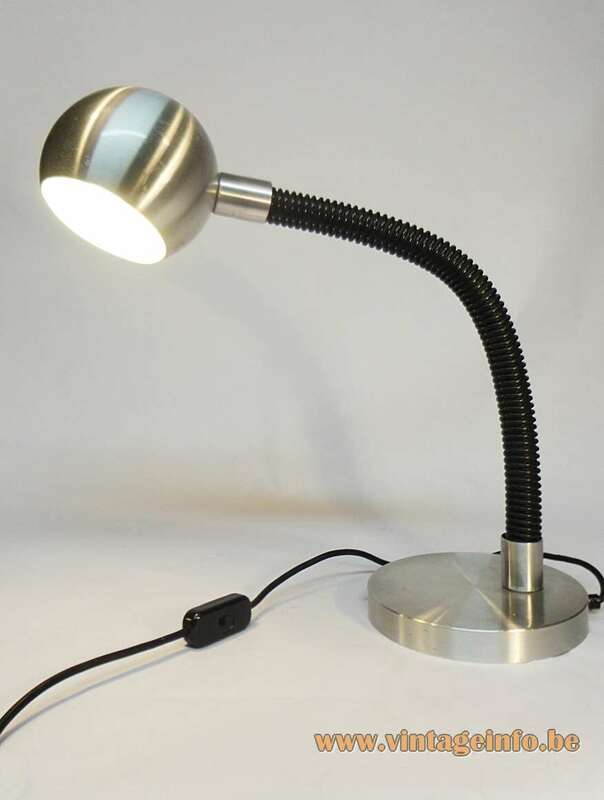 She also designed an inphrafil lamp (infra red lamp) for Philips and worked for the famous French industrial designer Roger Tallon who designed the TGV (Train à Grande Vitesse), the French high-speed electric passenger train and a collection of watches for the French company LIP. 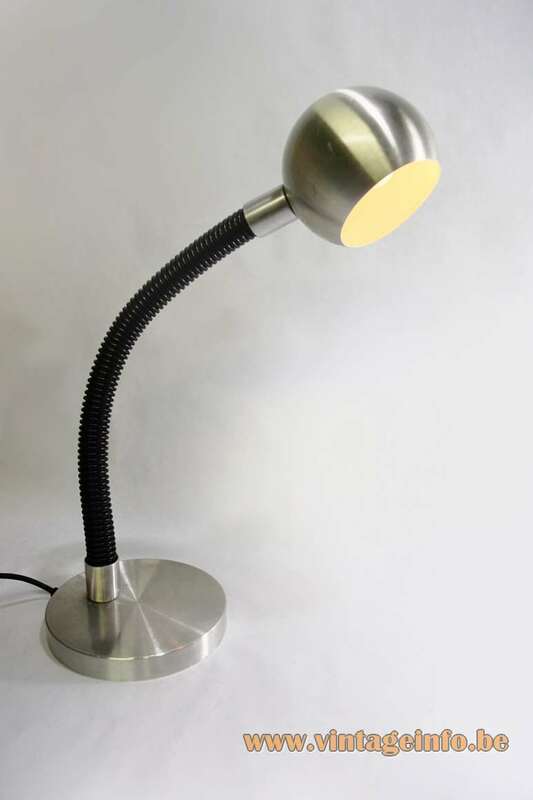 Roger Tallon also designed furniture, household tools and off course beautiful lamps, you can find them here on Vintageinfo. 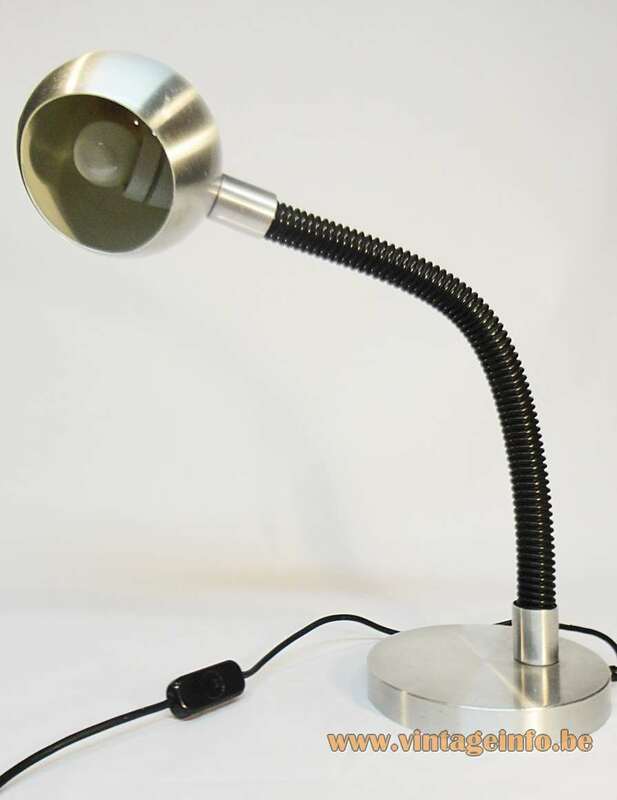 The Dutch company “Raak Amsterdam” was founded in 1954 by Carel O. Lockhorn (18 June 1923 – 6 October 2004), a previous employee of Philips Lighting Eindhoven. Raak, which means “to hit” in Dutch, implies design which precisely “hits the nail on the head”. “Paradijselijk ontwerp: slang en appel, kan het listiger? 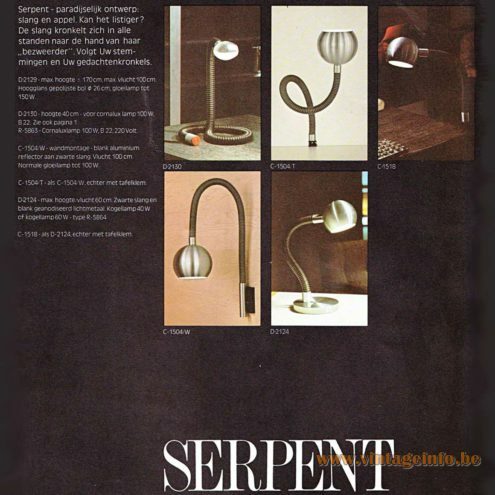 “Heavenly Design: snake and apple, can it be more cunning?